A very healthy recipe filled with bright flavors from oranges, jalapeño, cilantro, red onion, and lime. The fresh salsa is sweet and slightly spicy and adds so much flavor without a lot of extra calories (so you can feel less guilty about eating dessert later.) This is perfect for a weeknight meal because you can have the salsa ready in the time it takes to grill the pork. You can also use this salsa on grilled chicken or pork tenderloin. 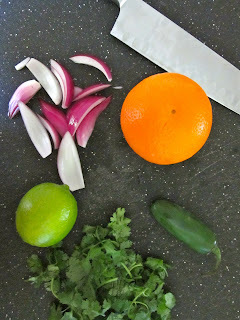 In a small bowl, combine the oranges, jalapeño, onion, cilantro, and juice from 1/2 of a lime. Season with salt and pepper to taste. Set aside. Preheat the grill. Pat the pork chops dry and season both sides with salt and pepper. Grill the pork chops over med-high heat for 3-5 minutes per side or until the center is no longer pink. Top the pork chops with salsa. This recipe was delicious. We basted the pork chops with a little bbq sauce also.